Owner of a stone oven or planning on buying one? These tips are for you! 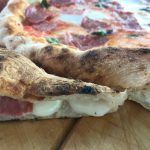 Having a few years of stone oven usage under our belts we thought it would be useful to gather a few tips and tricks about the use and cleaning of these ovens and share them with you. We own two Rofco stone ovens (the B20 and B40 model) and most of the tips you’ll find on the list below are especially helpful for other Rofco owners and bakers, but a bunch of them can also be applied to other bread / pizza / stone oven brands or for people who bake bread on a stone in their regular oven. Tip for easy cleaning: Ovens with a stainless steal exterior can get stained with not so attractive brown spots and smutches, especially around the steam vents. We found out you can very easily remove these stains by carefully wiping the door with a wet paper towel while the oven is hot. Because of the hot oven and the wet paper you get a sort of steam cleaning. Tip for cleaning your oven window: The oven window also gathers a brownish hue after several bakes and it gets harder to see through it. You can get rid of this brown coating by scraping it off with a sharp razor blade. We usually clean out our oven between bakes with an oven brush but we also use the vacuum cleaner and put the brush on the porous stone to really get those crumbs out. We never bake enriched breads that contain a lot of fat and / or sugar directly on the stones, because we want to keep them clean. We use a baking tray and /or baking paper. We also want to avoid getting the smell of onion and garlic in the stones because, even though we are fond of it, we do not want every loaf we bake to taste of it. So protect your stones when you can expect spilling or leakage. It is important that the stones get enough time to absorb the heat, that is why heating a stone oven takes so much longer than heating a conventional oven. But because the stones retain the heat for much longer, as soon as they are hot enough, you will be able to profit from their heat for much longer. One of the biggest advantages being that not much heat is lost by opening the oven door (unlike many household ovens, where the temperature can drop significantly). 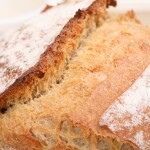 This initial blast of heat is crucial in bread baking, especially for good oven spring. When using steam, it is best to spray the oven walls. Avoid getting water on the (the protective glass over) the oven light because there is a good chance it will snap. To avoid those nasty bakers tattoos, buy some good quality protective oven gloves that go all the way up to your elbows. Make sure to clean your stones before the next baking session otherwise the crumbs that got left behind will burn and it will not smell nice plus the burned crumbs will attach to the bottom of your fresh batch! Choose your stone oven size wisely and think about how much bread you want to bake initially and in the future. If you know you are always going to bake just one or two loaves you can be happy for many years with a one tier oven that accommodates these small quantities. If you know you are already very fond of bread baking and are keen on baking for others or baking bigger batches, just have a good conversation with yourself and take space, other equipment like mixers and electricity bills into account and make an informed decision. Rofco, Häußler or other stone oven user? 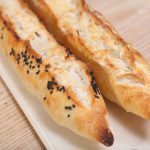 We and many other bakers would like to hear your tips and tricks and baking experiences with your oven. I’m thinking of buying a rofco as my orders are up to 12 – 14 loaves now and it’s a struggle with one and a half kitchen ovens. I have limited space in my kitchen and was thinking about having it on a trolley in my dining room. Would a normal plug be ok? We can tell you a Rofco B40 needs about 3100 W and a B20 needs about 2500 W.
We know in Holland we can just plug it in, but it is always wise to consult an electrician for your situation and also ask Rofco because we do not know about the exact rules and regulations for your country. Good luck with it and with all your baking activities! I just bought a Rofco B40. I didn’t buy the steam trays, can you tell me what you are using to create steam in yours. I see it in the picture above but can’t see it all. Did you buy it on Amazon? It is just a plant sprayer that sprays a water mist in the Rofco. We spray each tier for several seconds, especially the walls, avoiding the oven light like we say in the tips. We just bought ours (it’s one that you have to pump before use, so the water comes out with some force) at a local garden center. It works really well for us and this way you do not lose any oven floor space. Hi, I am about to buy the B40. Wondering if placing it on a counter height “36”) support table would make it a comfortable work height? We would suggest to try it out with some boxes. Each person is different (in height) and has different wishes and preferences of course. Ours is a quite a bit lower, on a sturdy plywood platform with caster wheels, but if you bake all day long for many days a week, a higher height would indeed be preferable. I am wondering if you have had to change the gasket on either of your ovens. I have the B20 and have been baking with it daily for over a year now. The gasket has never been tight as are gaskets on ‘regular’ ovens. The temp. on the top shelf has always been lower than the temps. on the other 2 lower shelves. I know all ovens leak a bit but this seems a bit over the top. P.S. Also, it seems as though the door simply doesn’t close as tightly as it did in the beginning either. I gently shut the door and rather than being firmly closed it can be jostled a bit as though the latch isn’t fully engaged. Yes we did replace it at one point, we recognize what you are describing. We advice you to contact Rofco or the reseller and order a new one and we are sure all will be well! The difference in temp is also something we and other Rofco users recognize, but it is a thing that we ‘work around’ by baking the loaves on one tier just a bit longer or you can have lighter and darker loaves, because different people prefer them. Hope and expect it will be alright! Thanks for the reply. It is nice to know that I am not the only one. I do have an extra gasket so I will go ahead an install it. Looks as though all I have to do is insert the metal pieces in each corner to corresponding holes in each corner of the stove. I, like you, have learned how to manage the different shelf temp. issue and now I find it handy because I bake different styles of bread in one bake. Ones with the most enrichments get placed on the top shelf as it is the coolest shelf and has ample room for oven spring. Have you had the issue with the door latch not latching as snuggly? IF you have, how did you remedy that? I did take the door apart to see if I could adjust something inside but there seemed to be no obvious way of tightening anything up. With our B40 we always give it an extra ‘knee’ to close the door shut, with a little bit of extra effort and then it feels secure and quite snug. When in doubt just contact Rofco and let them help you and solve anything that is not working properly. We think all Rofco owners take the few ‘quirks’ of the oven because with a few ‘work arounds’ it works well and produces great loaves. Sometimes wish for some updates or alterations like a bigger window in the oven door, but they never seem to have the time for it alas! Just wondering what is your approach to continuous baking in the B40. I know you mentioned before 235 and down to 50 degrees after 15 minutes and this works for me on a one of bake. 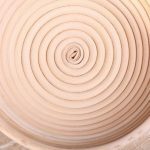 Do you have a different approach for continuous baking? 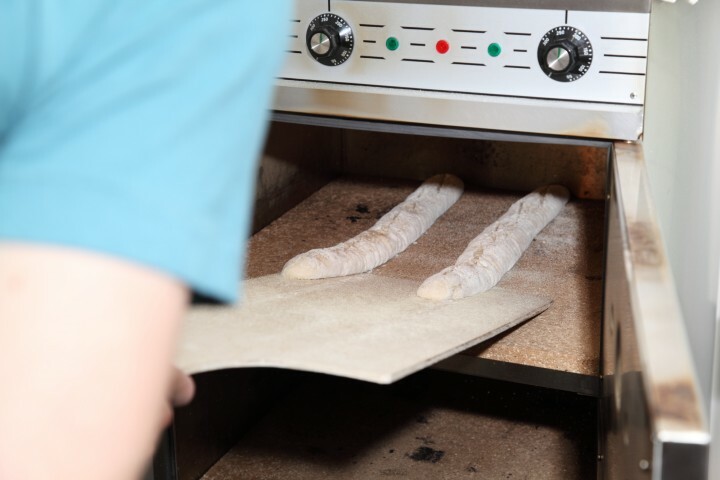 We do not use the continuous baking option ourselves, but do know that the idea is to continuous bake at 200 C. Because of the increased distance to the heating elements (compared to the B30) your loaves should not burn at the top this way. Thanks for posting the tips. I bake bread at home regularly (3 – 4 days a week) and the wall oven I was using just went out. Looking at placing a bread oven in a separate room in the house. The Rofco looks perfect for me from a size and price perspective. I noticed the temp only gets to 480(deg F)! Do you feel that affects the baking? Generally pizzas and breads are cooked at a higher temperature….Even residential ovens go to 500 or 525 F.
Hope this helps, good luck with your decision. I am currently a baker in an artisan bakery in the UK. I am going to be starting my own micro-bakery with a viewing to grow. I am looking at the Rofco B40 as my best prospect initially and then utilising it in a bigger set up eventually. I was wondering if when you steam the oven you just use a garden sprayer like it looks like you do to inject the moisture? And does this give you a good crust? I am used to steam injected ovens so this will be taking a bit of a back step for me initially! Yes Aaron this is our preferred method. This way we can direct and control the amount, it’s quick and also, not unimportant with the Rofco, we do not lose floor space. Because the alternative with this oven is to use the steam trays that you can buy with the Rofco, but we just did not like them enough to use them instead of the sprayer. 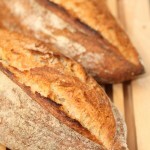 And yes, we are very happy with the quality of the crust on loaves and baguettes etc. Good luck with your decision making and plans! Firstly I’m finding your website extremely helpful, well done! My Rofco B40 is arriving next week and I am super excited. Just a question with regards loading the oven with 12 loaves. Is plywood boards best? Also is it best to make boards that take 4 loaves to load each deck in one go or individual peels and load the 12 loaves separately? You can look at the measurements if you want to make them yourself. With these measurements you have enough room to place two breads next to each other in a B40 without hitting the bread that’s already in there. Hope this helps, good luck with everything! Hi! Have you had any success baking pastries (croissants etc) in a Rofco? I’m struggling to get the temp settings right. I have an oven thermometer placed in the oven that I can see through the window of my B40 but it drops to about 150c from 220c when I load it and I’m not sure if this is affecting how the pastries bake (a bit flat). Thanks in advance! We do not bake pastries in our Rofco oven. We are a bit spoiled and also have a ‘dedicated’ fan assisted pastry oven (a large commercial convection oven with two fans). It is possible to bake pastries in the Rofco and we do know of other bakers who do or did so, but also heard it is a bit of a process to get it right. But we think it is a bit strange your oven temp dropping this much just by loading the oven. If the oven is preheated well it should be way less. Maybe try and preheat it longer (always at least 1.5 hours maybe even 2 to get the heat into the stones). Sorry I am late to thank you for your kind reply, I only just remembered to check back! Ahh, a fan assisted pastry oven sounds amazing! I will persist with the Rofco and you are right, I don’t think I have been preheating for long enough so I will give a 2 hour pre-heat a go before baking next time. Thanks again! I’m so curious to know, have you had better success using the Rofco for pastry after re-heating the oven for 2 hours? 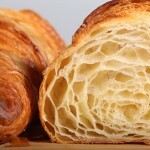 Your pastries shouldn’t go flat once going into a temp of even 150 as the yeast burns off it’s energy over 38. If you are baking them with the bottom heat on, i would suggest you bake it with the bottom heat off. I use a deck oven in the bakery i work in so a bigger version of what you have and we bake them at around 450f so around 232c. Hi, thanks for your comprehensive analysis and generosity answering questions! Have you baked many tinned loaves in the Rofco B40? Just wondering if the oven bakes/colours the outside of the loaves evenly? Also, does it bake enriched breads well? We almost exclusively bake bread without tins. Only some sandwich loaves in tins. There can be a difference in bakes / colours depending on which tier loaves are baked on and how fully loaded the oven is. This can also be different from one Rofco to the next we understand from other bakers. It is very easy to adapt as you get to know the workings of your particular oven to leave the loaves on one tier just a minute longer to get the desired color. Or maybe you or your customers want lighter and darker loaves, according to taste. We personally do not experience any of this as a problem with the type of loaves we bake (mainly hybrid and sourdough). But we have to say for enriched breads we use a different oven, a convection with twin fans, so we are not the most experienced bakers to tell you how well the Rofco does with these breads. Thank you – appreciate your reply.